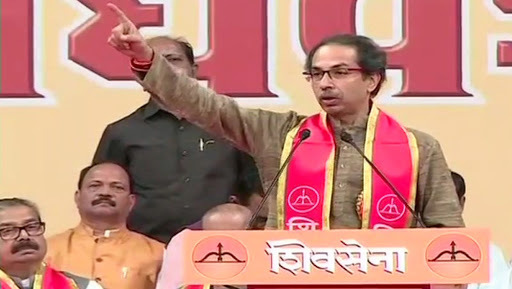 Mumbai, April 16: Hailing Prime Minister Narendra Modi for strongly rebutting those talking about the separation of Jammu and Kashmir from the country, the Shiv Sena Tuesday said he must commit that the PDP, NC and the NCP won't be part of the NDA after elections even if it is short on numbers. The Sena, in an editorial in its mouthpiece Saamana, said while it is good that the prime minister has spoken against those attempting to divide the country, he needs to give people two assurances. "Yet we keep kissing their furry caps to achieve the numbers in Parliament. This is nationalism of convenience," it alleged. The Sena added that People's Democratic Party chief Mehbooba Mufti has a similar stand on the Constitutional provisions for Jammu and Kashmir and she has warned that the state will not remain with India if its special status is revoked. "Modi has spoken with grit - the way an Indian prime minister should have spoken. He has spoken about how three generations have been destroyed under Abdullah and Mufti's regimes," the party said. "Modi has also spoken about displacement of Kashmiri Pandits. However their ghar wapsi (return to roots) couldn't happen in the last 5 years," it said.